Dale Brown has been a member of the Vent Haven Board of Advisors for more than 25 years. This group meets annually at the International Ventriloquists’ Convention to review decisions and create policies to protect the Museum. Vent Haven is the only museum dedicated to the art of ventriloquism. Housing more than 900 dummies used by ventriloquists from the 19th, 20th, and 21st centuries, Vent Haven’s uniqueness draws tourists from literally around the world. The founder, W.S. Berger, spent more than 40 years amassing a personal collection of everything related to ventriloquism: dummies, puppets, photos, scripts, memorabilia, playbills, posters, recordings, and on and on and on! In 1973 his massive collection was officially opened to the public and since then has nearly doubled in size as its name and reputation have spread worldwide. In addition, Dale plays a role at the International Ventriloquist Convention, which is the world’s largest gathering of ventriloquists held annually in Fort Mitchell, KY, home to the Vent Haven Museum. For more information on the ConVENTion, go to www.venthavenconvention.com. Dale Brown of Waukesha wasn’t always an internationally known ventriloquist. He was once in a rock band, a journalism teacher at a high school, a public relations professional and corporate consultant. But he always found himself right back where he started: with Chip Martin hanging out next to him offering witty and often hilarious insight into life. Ventriloquism is often thought of something for children or an art mixed in to a night at a comedy club. Most people can name Jeff Dunham or “America’s Got Talent” winner Terry Fator, but Brown calls them personal friends. In his hallway, Brown hangs photos and signatures from those greats along with Muppets creator Jim Henson and Lamb Chop famed Shari Lewis. Brown started ventriloquism in sixth grade, saving money from his paper route to buy a Jerry Mahoney dummy from the Sears catalog. He remained interested until he got to college. It wasn’t until the end of his career in teaching that he brought back his old hobby. As Brown pursued his second career in public relations, he attended a Maher School of Ventriloquism in Colorado. He decided then that he could uniquely marry his two passions. Brown said that having the puppets not only allowed the company to have a mascot, it opened the door for better corporate communication. From presentations to newsletters, puppets became a light-hearted way to address serious issues in the company culture. His client list has more than 50 companies that have utilized puppet services in some way including national companies such as J.C. Penny and John Deere and local companies such as Waukesha Engines and Kohler. However, Brown said corporate work began to trail off and he started focusing more on banquets and special occasions, each show customized for the audience but boasting the same funny characters. Brown has an extensive list of characters on his resume. Bertha the Bag lady is an eccentric character that has appeared on “Entertainment Tonight” and “Good Morning, America” with Brown. Shaggy the dog and Louie the world’s oldest jockey round out the cast along with Brown’s classic Chip Martin. “People say Chip is my alter ego,” Brown said. Ironically, Brown said his personality is completely different with no puppet in sight. In Brown’s more than 30 years in ventriloquism, he said he has run into mostly positive responses from audiences. However, like any performer, he occasionally faces a tough crowd. Brown said that being a ventriloquist provides unique challenges, but anyone who is willing to put the time and effort into learning how can do it. Brown is gearing up for the International Ventriloquist ConVENTion in Cincinnati, Ohio this summer. He will teach a seminar on banquet performing for nearly 600 professional and beginner ventriloquists including those who do what Brown calls “educational ventriloquism” for youth, “gospel ventriloquism” using puppets to preach and comedic ventriloquists. Brown, now retired from his day job in public relations, is looking forward to more local banquet and special event work in the future. He said the market is tough, as more people are inclined to hire DJs for live entertainment at special events than they are to hire a ventriloquist. However, it’s easy to see by the smile on his face as he looks at Chip Martin that he’s not ready to give up ventriloquism any time soon. He’s ten years older than I am, yet he looks so much younger. That was my first thought as I shook hands with Dale Brown–the brains behind Brown and Martin, a long-time local public relations/consulting firm. No, I didn’t need crisis management, and I didn’t have a new product that needed pitching. Dale and I were meeting for lunch because of a relationship that dates back to the 70’s. Dale taught high school English, journalism and served as our adviser at “The Wind”: Sheboygan North’s high school newspaper. Dale was a “cool” teacher–his hair was long, his ties were wide when some of his co-horts were still dressing like members of the Nixon cabinet. He got our sense of humor, encouraged our interest in the printed word and was still able to maintain the respect that a teacher deserves. It wasn’t quite “Room 222” at our end of the second-floor hallway where we cranked out a paper, but it was very, very nurturing. I’d always had an interest in the media–Dale did all he could to turn the spark into a flame. I was lucky, because Dale would leave teaching, put a dummy on his knee and head out to conquer the world of public relations. The “Martin” in “Brown and Martin” is his wooden pal, Chip (the guy wearing the jacket). Dale’s ventriloquist act turned into a unique way to motivate corporate groups and deliver a message. That evolved into public relations, speeches and an Internet adjunct over the years. Sheboygan North’s loss is an industry’s gain. I knew of Dale’s exploits over the years, and knew what a presence he’d become in the business community. He’d take up his passion for speed, becoming a road racer in his off time, as well as a Harley Rider. He’d dip into this blog every now and then, leaving compliments that would always make me blush since I thought so much of his opinion. We’d finally meet up face to face at lasts spring’s “Black and Blue” ball at the Midwest Airlines Center–Dale gives back, too, helping MDA and other causes (he and his Corvette club give rides to kids with disabilities each year). Nice guy and generous, too. As the new school year begins, may your kids be so lucky as to have a Dale Brown in their scholastic lives. Someone who inspires, encourages and supports. They don’t need to become mid-life lunch buddies, but they need to have something more than a I-said-it-kid-and-I-want-you-to-spit-it-back-at-me-at-test-time relationship. It can change a life, or at the very least reinforce a child’s passion. Dale Brown did that for me. The least I could do was buy him lunch. When a second-grade teacher remembers your name some 50 years later, you have to wonder what you possibly could have done back then to leave such a lasting impression. Dale Brown is no dummy – though he hangs out with a few – but he’s wondering. Wisconsin Ventriloquist Brown showed up on NBC’s “Today” show last summer in a segment about an international convention of ventriloquists. With his sidekick Chip Martin (the real dummy) on his arm, Brown, 60, of Waukesha, was spotted by Helen Springs as she watched television during a visit to her son’s home in Phillips, Wis. The name popped up “and BOOM! I screamed,” she said.Now she’s convinced him to bring his Chip and Dale act – no, not the Chippendales, if the male dance revue just came to mind – to her hometown birthday bash Nov. 10. “Dale is one of my kids,” she said by telephone from her home in Marion, Ky.Springs, who’s about to turn 90, claims never to forget a student from her 30-year teaching career in Whitewater. Shhhhhhh. Don’t tell the privacy police, but “I have all their records,” Springs said. “When I read about them in the newspaper – I still get the (Whitewater) paper – I send them congratulations. Once they’re my kid, they’re always my kid.”She taught Brown as a second-grader, when he knew her as Mrs. Silvernail. She later married a hometown Marion boy after her first husband’s death. “He was a quiet little fellow,” she said of Brown. “He wasn’t very big.” Or funny, as she recalls – a point of departure from Brown’s memory. He said he was funny, but shy. So he didn’t show it until about sixth grade, when he was inspired by ventriloquists Edgar Bergen (the voice and movement behind Charlie McCarthy) and Paul Winchell (who made the Jerry Mahoney character famous, or vice versa). Brown bought his own Mahoney-like puppet and taught himself the art of talking though unmoving lips. He got good enough to perform for scouting groups and church meetings. Springs is relieved that he didn’t start in second grade, imagining words coming out of inanimate objects such as bookcases. “He would have driven me nuts,” she said. Ventriloquism wasn’t cool in high school or college, though today, I’d guess, you’d win points if you could talk and drink beer at the same time. After college, Brown spent six years teaching high school English and journalism. Teaching wasn’t his cup of tea, so he worked in public relations, kept building his ventriloquist’s repertoire and, in 1984, started his own marketing firm that blends his puppet mastery with public relations, public speaking and comedy. You think that sounds like a strange combination? Not so strange that a company didn’t once ask Brown to send a memo under a dummy’s name notifying employees about layoffs. He declined. He’s got a stable of five characters and a pile of scripts that he can personalize for most occasions, from training seminars to celebrity roasts. He gets help from his wife and business associate, Leslie, who says she writes only the funny stuff. As lifelike as these puppets can seem when Brown starts his shtick, they know their place at home, he said. Well, at least he knows it even if they don’t. “They’re tools. They’re in cases. They don’t sit around the dinner table.” So it was a little disconcerting when Brown uncased Chip, and I found myself talking to this wiseacre who seemed to have a snappy answer for everything. Oh, well, it wasn’t the first time I’ve had to interview a dummy. Brown said he would drive to Marion in western Kentucky, population about 3,000, and has agreed to perform for expenses only at the historic restored arts center that once was a high school – the one from which Springs graduated. “I hope we have a big crowd,” she said, sounding a little anxious as the organizer of a party that’s “tooting my own horn. I hope he isn’t disappointed in our little country people down here,” she said. I don’t think she has to worry about Brown, her former student. But she might want to watch out for Chip, the blockhead. His hobby becomes lucrative career! A few weeks ago a picture of my shop was printed on the front page of The Wall Street Journal. And more recently a scene from my shop was featured on the reverse side of the front page of Brown & Martin’s newsletter. It doesn’t get much better than that! Dale Brown has been a ventriloquist since the age of 12. His dummy, “Chip Martin”, is not only Dale’s ventriloquist partner but also Dale’s business partner. The puppet is the “Martin” in “Brown & Martin”. Brown & Martin Inc. is a public relations and marketing firm. 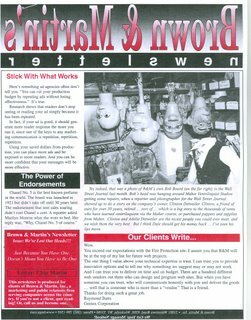 Dale’s puppets are very popular in the custom newsletters Brown & Martin creates for itself and nine other companies. “Bob Board” (on the far right in the photo) happened to be hanging around my shop getting some minor repairs when the photographer for The Wall Street Journal stopped in and that’s how “Bob” ended up in the picture for the WSJ. Brown & Martin is now known as Chip off the Block. We are still located in Waukesha, Wisconsin. Having grown up in the shadow of Charlie McCarthy, Candice Bergen was selected by CBS to be a contributing correspondent for 60 Minutes on a piece about ventriloquists. She has first-hand knowledge about how and why people can quickly develop bonds with puppet characters. That “bond” is the basis for Brown’s success. “The most effective communication is done on a personal level,” Brown said during his interview for 60 Minutes. “And puppets are more personal than corporations. Employees, distributors and customers find it easier to relate to our characters than to corporations. They trust them to be truthful and expect them to provide some laughter. That’s why they pay attention to what the characters have to say,” he said. Brown’s ventriloquist characters appear at corporate functions, frequently asking executives poignant questions that audience members would like to have the nerve or the opportunity to ask. Some of the characters also communicate via newsletters. “We currently produce eight different newsletters which are edited by characters that were specially created for individual companies,” Brown said. “Interestingly, Candice said she understood how a puppet’s individuality could be effectively communicated via the written word just as her father used them to communicate on the radio. You don’t have to see the character to appreciate its personality or point of view,” Brown explained. “The magic is that the puppet is not held to the same standard as a person. It can acceptably cross lines that would be unacceptable for a person to cross,” Brown added. Brown also uses ventriloquist characters in parts of his motivational keynote speeches that he delivers to convention audiences across the country. “The puppets are simply tools that we use to enhance the effectiveness of the message,” Brown said. “After one of my convention programs last year an audience member came up to me and said, ‘I laughed until I learned.’ That pretty well sums up how our characters effectively help to make messages meaningful and memorable. And it’s probably why 60 Minutes contacted us,” Brown said.